It seems that lately, so much of what I have been reading has felt like a chore. Whether it is books for book club, or bad choices on my part, I find myself more often than not just putting books down and not picking them up again. But I read the Betsy books for pure pleasure. As much as I try to draw them out, I just find myself zipping through them too quickly. This 2-in-1 book follows Betsy through her junior and senior high school years. There is a lot that feels familiar from her previous high school books: romance, the "gang," outings, fashion and school. In Betsy Was a Junior, Betsy is enchanted by her older sister's experience with university sororities and she decides to form her own. It of course ends disastrously, with Betsy learning a valuable lesson about excluding people. 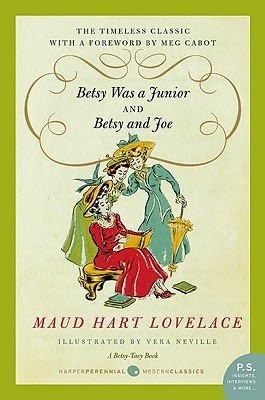 In Betsy and Joe, Betsy is caught up in a classic love triangle with Tony and Joe, although the book's title gives a hint as to where her heart lies. (Go Team Joe!) The romantic drama is the backdrop to all the fun and festivities of her senior year. Once again it is hard not to love Betsy and her world of Deep Valley. Everything just seems like so much fun. There are always parties and sleigh rides and swimming and picnics and plays, and they are always eating the tastiest-sounding food. I already summed up a lot of my thoughts about the Betsy books in my previous reviews, and the same applies here. If you've read the earlier books, of course you will read and enjoy these ones, the way you would watch the next installment in an addictive TV show. And of course I'm going to read the rest of the series with Betsy's European adventures and her marriage. I'll try to draw it out, but I doubt I will be able to resist binging again.